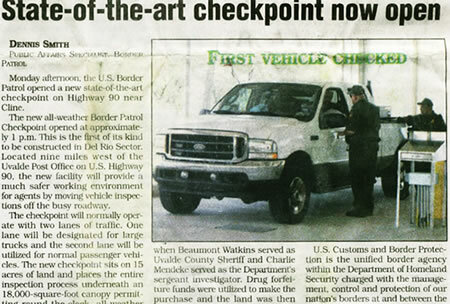 What should be noted here and I can’t stress enough is that the U.S. Supreme Court has explicitly ruled that internal checkpoint seizures such as this one must be very limited in scope and very brief in the absence of consent or probable cause. It should be clear from the video that the agents had neither consent nor probable cause to believe the driver was in violation of any immigration law enforced by U.S. Border Patrol agents. As such, the extended detention was most likely illegal. Additionally, the actions of the Border Patrol agents clearly rose to the level of harassment and intimidation. Especially after the agents contacted the driver’s military command regarding the encounter. What you see happening in this video is one of the reasons I opt not to go to secondary during checkpoint encounters. Once an agent gets you in secondary, they have all day to mess with you. By staying in the lane of traffic, you force them to make a probable cause determination within a reasonable time frame. If they take action against you for not going to secondary when they don’t have probable cause (or even reasonable suspicion in most cases), you have a clear cut civil rights violation ripe for the courts to hear.